Present state: Demolished - no evidence of the station remains. The Ibis Hotel stands on the site of the entrance building with a car park on the site of the platforms. Notes: Greenwich Park was built on a curve with three platform faces, a side platform and an island; for much of their length the platforms were covered by awnings. There was also a central road between the platforms which allowed locomotives to be detached from incoming trains and run-round ready for departure. A water crane was sited at the London end of the island and a siding for spare engines lay behind the signal box. 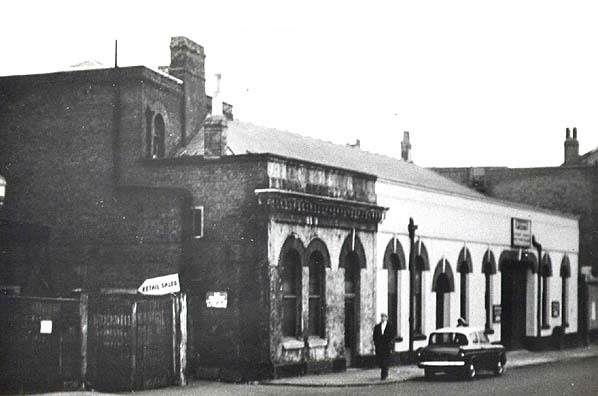 The substantial brick entrance building was on the west side of Stockwell Road; it included the booking hall, a buffet, together and ladies' rooms for both first and second class passengers. There was a canopy at the front of the building and a two storey stationmaster's house alongside. At the rear of the building there was a small covered concourse giving access to the platforms. The station was initially called Greenwich but after the amalgamation of the LCDR and SER in 1899 it was renamed Greenwich Park in 1900 to avoid with the SER's Greenwich Station. 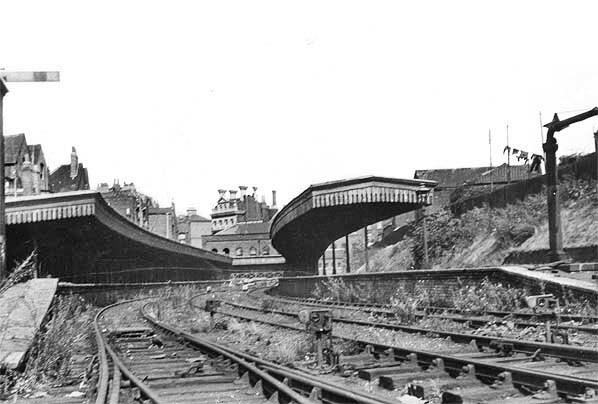 After closure the platforms were buried but the station building was not demolished until about 1968. During the 1920s it was leased to the Mayfield Temperance Billiard Club but before demolition it was used by a timber merchant. The Ibis Hotel now stands on the site of the station building with a car park on the site of the platforms. The original plans for the Greenwich Park branch proposed a line from Nunhead through Greenwich terminating at the Royal Dockyard in Woolwich. With the opening of the South Eastern Railways extension from Greenwich to Woolwich in 1849 there was no longer a need to serve Woolwich and the London Chatham & Dover Railway were eventually authorised to build a 2m 18ch line between Nunhead and Crooms Hill, on the western side of Greenwich Park by an Act of Parliament in July 1863. 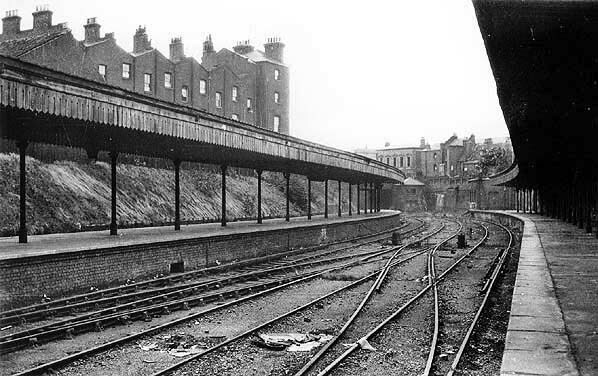 Financial problems delayed construction until 1871 when the branch opened as far as Blackheath Hill on 18th September with one intermediate station at Lewisham Road; a second at Brockley Lane was opened in June 1872. There was a regular 45 minute service although most trains shuttled between Nunhead and Blackheath Hill which was unpopular with commuters who had to change at Nunhead to reach central London. Despite disappointing receipts, the LCDR continued with their proposal to extend to Greenwich. The original powers had lapsed and a new Act was required which was received in 1881. The company was still in financial difficulty and the extension wasn’t completed to Greenwich Park (Greenwich until 1900) until 1st October 1888. A substantial terminus was built in Stockwell Street and not Crooms Hill as originally planned because housing development had overtaken the railway. The extension failed to attract additional traffic to the line which was unable to compete with SER's direct line from Greenwich into central London. Leisure traffic was more successful however with the branch providing a convenient route to Crystal Palace, a major tourist destination in South London. With the amalgamation of the LCDR and SER in 1899, Greenwich was renamed Greenwich Park to avoid confusion and with the introduction of electric trams from 1908 it was soon clear that the line could never make a profit. A push-pull service was introduced in 1913 in an attempt to cut losses and by the start of WW1, a 20 minute peak hour service and 45 minute off peak service was being maintained. Both the Greenwich Park and Crystal Palace branches were closed on 1st January 1917 as a war time economy measure; the Crystal Palace service was reinstated in 1919 but the Greenwich Park branch never reopened. 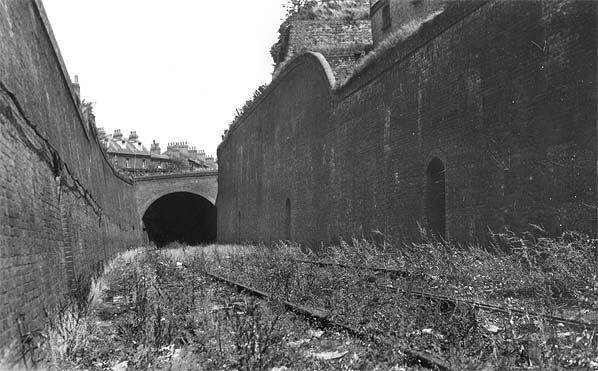 After closure, the line remained open for freight traffic as far as Brockley Lane and the section between Brockley Lane and Lewisham Road was used for carriage storage. There was a proposal to electrify the line and reopen it but this was quickly dropped. 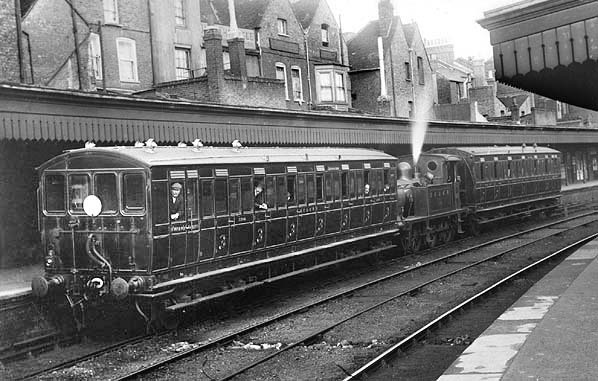 In 1927 Southern Railway refurbished the section of line between Nunhead and Lewisham Road as part of a scheme to improve freight operations in the locality; this involved building a spur down to join the Mid Kent line between St. Johns and Lewisham, at the same time the track was reballasted and relaid reopening on 7th July 1929. 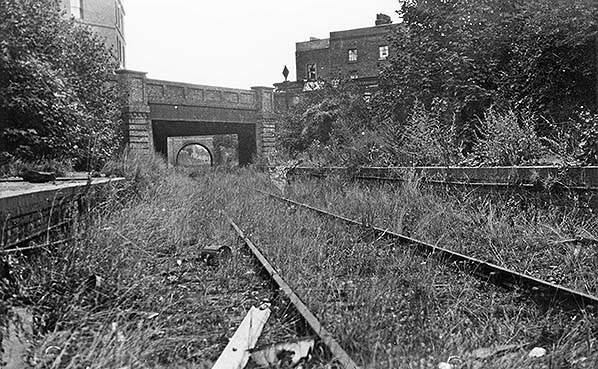 The remaining severed section of the branch between Lewisham Road and Greenwich Park was formerly abandoned by Act of Parliament in 1929.The new loop line number of freight services in the area and it was electrified in 1935. 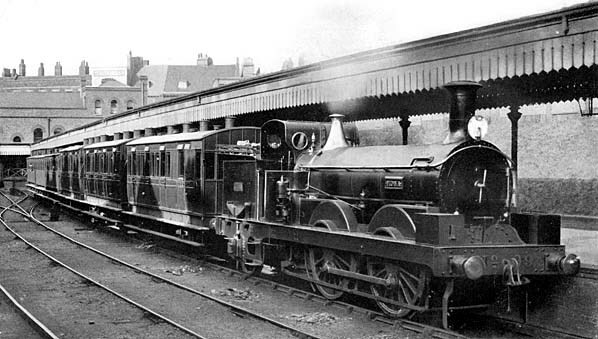 Passenger trains began using the loop on 30th September 1935, with a peak-hour service between Dartford and St. Paul's (Blackfriars) taking the pressure off the overcrowded services into Cannon Street and Charing Cross. This passenger services was withdrawn on 16th October 1939 as a war time economy measure but was reinstated on 12th August 1946. Today the loop line forms an important part of Southeastern rail network with two trains an hour in each direction running between Dartford and Victoria. 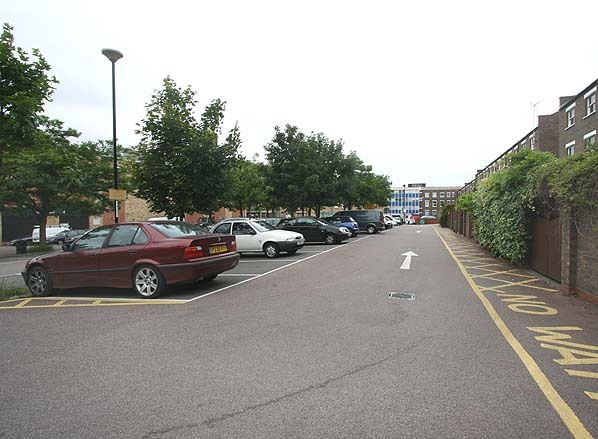 Since the line reopened in 1929 there has been no suggestion that the two intermediate stations at Brockley Lane and Lewisham Road should be reopened. 1895 1:1056 OS town plan shows the layout of the station in a cramped position. Note the central road to allow running round. to try and cut losses on the line. Greenwich Park Station c.early 1920s. 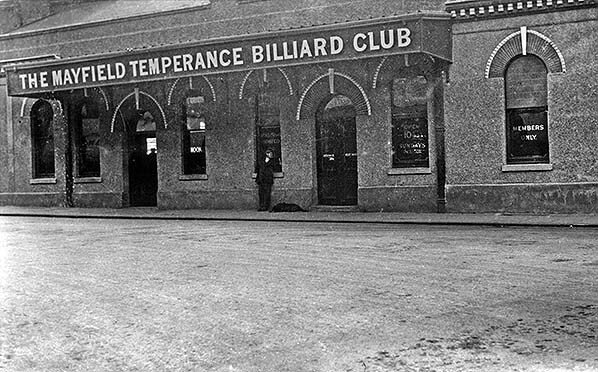 IN the THE 1920s the street level building eas leased to the Mayfield Temperance Billiard Club. 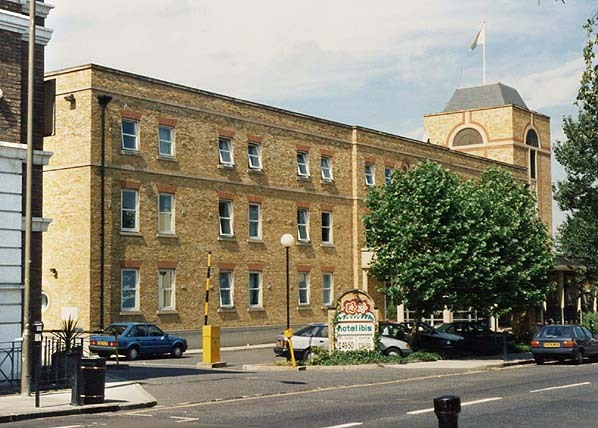 The Ibis Hotel now stands on the site of the station entrance in Stockwell Street (January 1997). Taken from the same viewpoint as the picture below. The site of Greenwich Park Station in June 2007.